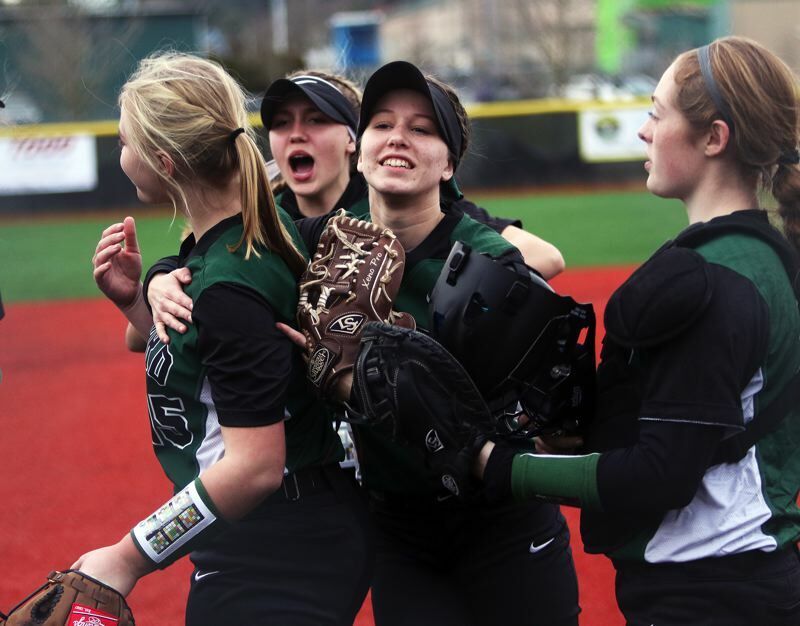 It seems to surround the Tigard High School softball team, as the Tigers get ready to jump into Three Rivers League play — and with good reason. After all, Tigard, coming off a solid 2018 season, boasts both strong returnees and promising newcomers in the 2019 campaign. "I'm really excited to see what happens with this group," Tigard coach Pete Kostel said. "We're young again, but we're getting better every day. I'm just excited for this season." The Tigers, while they may have lost Ashley Davis, the 2018 Class 6A Pitcher of the Year to graduation, still have a strong group of returning players from last year's squad that finished in second place in the Three Rivers League standings at 11-3, while going 24-5 on the season, and reaching the quarterfinal round of the Class 6A state playoffs. Among the returnees is shortstop Maddie Hoover, who is the only senior on the Tigard roster. Last year, Hoover was a second-team All-Three Rivers League selection. "Her leadership is unquestioned," Kostel said of Hoover. "She's our anchor in the infield at shortstop." Junior Lexi Klum returns in center field, and in the leadoff spot in the Tiger batting order. Last year, Klum was a first-team All-Three Rivers League pick and second-team Class 6A All-state selection as an outfielder. Tigard has another key returnee behind the plate in junior Emily Paulson, who is starting her third season as the Tigers' catcher. Last year, she was a first-team All-Three Rivers League selection and honorable mention all-state pick. Tigard has not one, but two options to replace Davis in the pitcher's circle in sophomore right-hander Sophia vanderSommen (who was a first-team All-TRL pick and all-state honorable mention pick as an outfielder last year) and hard-throwing freshman left-hander Makenna Reid. "I love our pitching," Kostel said. "It's a really good one-two combination. We could go with either one of them each game." Freshman Sera Reilly could also pitch some for the Tigers this year. Reid or vanderSommen, whoever is not pitching at the moment, will likely be playing at first base. The Tigers have two other key returning juniors in Abby Soderquist and Elli Dardis. Soderquist, who can play anywhere around the infield, has been playing at second base for the most part so far this season. Dardis can play in the infield or the outfield. "The versatility of this group is a big thing for us," Kostel said. Freshman Kani Korok is playing at third base. Other outfielders for the Tigers include Reilly, freshman Kali Kisor, junior Emilie Otto and freshman Kaylin Kisor. Sophomores Laura Masters and Katie Regalado are other infielders. Freshman Eliot Minor will see action at catcher. "I'm excited to coach this group," Kostel said. "They work hard and they play for each other. Our team chemistry will be a strength. And, when we have a good approach at the plate, we can hit the ball really well." As for the Three Rivers League this season, Kostel sees defending league, and defending Class 6A state champion Tualatin as the favorite. "Tualatin sets the bar in our league," he said. "They're the team to beat. Their kids know the expectations. But, when we play well, we can play with anyone." The Tigers will be back in action on Monday, when they travel to Westview for a non-league game starting at 5 p.m. On Wednesday, Tigard will be home to face Sunset in a 5 p.m. non-league contest. The Tigers will also be home on Friday to face West Salem in a 5 p.m. non-league game.